Thanks for your patience, guys. No new episodes ready to go at the moment because I’m still writing the DC-3 type rating summary episode. It’ll be worth it, I promise! I’m taking from four hours or so of audio and more than two GB of photos to get it right. 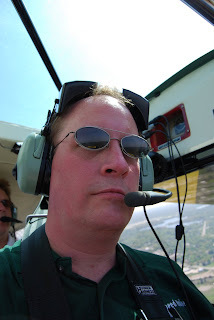 In the meantime, I’m scheduled to go fly the Citabria with Barry tomorrow. Weather doesn’t look great, but we’ll see. I have a tailwheel endorsement from the DC-3 type rating course, but I’m smart enough to know that that doesn’t really qualify me to go fly a Citabria (not that anyone in his right mind would rent one to me at the moment). The DC-3 takes off and lands beautifully. You need to pay attention, but it’s a wonderfully smooth aircraft. With 22,000 lbs of mass loaded into the momentum calculation, it should! But taxiing the DC-3 is like trying to drive your house around the neighborhood from an upstairs window. You can’t see much and you have to be pretty intuitive about where your mains and tail are. The Citabria, on the other hand, is pretty easy to taxi (at least without any real crosswind), but squirrely on takeoff and landing. A much different creature. I really want to get so that Barry says that he’d sign me off in the Citabria just like an initial tailwheel endorsement. And that’s a few hours away. But there’s no rush for that. Weather and time permitting, I’d like to head out and do some basic aerobatics. I only booked two hours, so it’s possible that getting chutes and other prerequisites to real aerobatics might eat too far into the allotted time. If that’s the case, I think it’d be good to just go do some spins and other VFR upset recovery. If we can get the aerobatics in, it’ll be cool to have Barry demonstrate the basic syllabus of maneuvers and let me try a few. Not saying that I’m going all aerobatic on you and am planning to forsake the other elements of training. But I’ve been training for the time-intensive certificate and rating (e.g. private ASEL and IA) for most of the time in my logbook and it’s been really fun reaching out to experience, or obtain ratings or endorsements in, other areas of flight. And the cool thing is that a lot of these ratings and endorsements are fairly quick in coming, so you get the satisfaction of adding things to your certificate and/or logbook. If I can get the seaplane rating done soon enough, I might be able to go a good few months without my then-current pilot certificate being other than a temporary. If I play things right, by OSH this year, I’ll have added instrument, multi, complex, tailwheel, high-performance, seaplane, and a DC-3 type rating. And all but the instrument rating in less than a total of about 22-25 hours. Boy, do I love this stuff. Get out there and challenge yourself! The summer is young!